Throughout 2015, organizations in San Diego’s Balboa Park looked for ways to commemorate the centennial of the Panama-California Exposition which put Balboa Park on the map. The 1915 Exposition showcased the best in technology, innovation, and culture. Part of the Exposition’s success was the trolley system, which took visitors across the country to San Diego and from the City train depot to Balboa Park. What better way for The San Diego Model Railroad Museum (SDMRM) to honor the exposition than with a scale model version of Balboa Park, with its trolley, as it was in 1915? Wanting to design a novel, memorable experience honoring the spirit of the 1915 Exposition, SDMRM worked with Balboa Park Online Collaborative (BPOC) to create an interactive to complement the model environment. The Centennial Railway Garden strives to spark visitor interest across disciplines. SDMRM highlights engineering aspects of model building in much of their work, and collaborated with local MakerPlace to 3D-print details on the garden’s models. To balance the engineering focus, SDMRM wanted to incorporate humanities-based historical information about the 1915 Exposition. 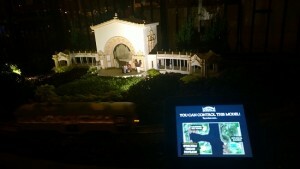 BPOC designed a web app for iPads placed in front of three of the garden’s models, which shares historical facts and quizzes visitors on trivia about buildings in the Exposition. The web pages on the iPads are served by three small Raspberry Pi computers running a Node.js webserver, which are wired to amplifiers and electrical relays to trigger lights and sounds on the model when a visitor correctly answers a question. The bell tower rings; the fountain turns on; the Spreckels Organ lights up and plays a tune from an archival recording. Incorporating these responses into the physical environment serves not only as a reward for learning, but a delight characteristic of the wonder of original Exposition. 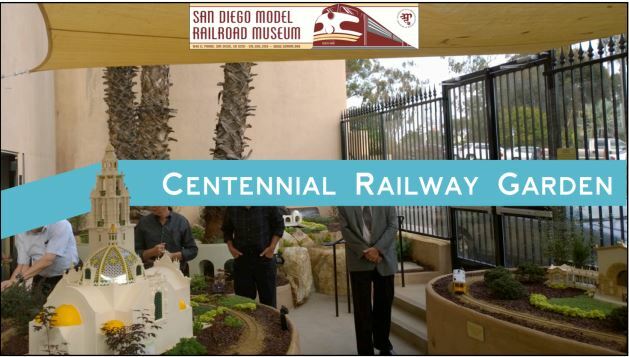 As part of the grant, SDMRM hired BPOC to create, administer, and analyze a two-month survey of the SDMRM visitors’ experience with The Centennial Railway Garden exhibition. The exhibit increased attendance; of over 300 visitors surveyed, 15% came specifically for The Centennial Railway Garden. On a 5 point scale, 53% of those surveyed gave the highest rating to “it was a highlight of my visit today,” 82% gave the highest rating to “I learned something interesting from my exhibit experience,” and 90% gave the highest rating to “I was satisfied with my exhibit experience.” Visitor feedback confirmed that the exhibit experience worked. SDMRM is working with the City of San Diego to make the exhibit—planned only to be temporary—a permanent installation. 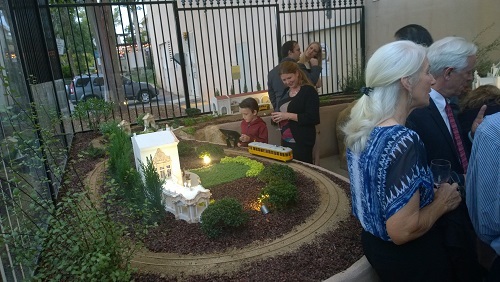 The Centennial Railway Garden honors the innovation of the 1915 Panama-California Exhibition, combining traditional railroad models with modern iPad interactivity, and providing visitors with a memorable cross-disciplinary learning experience. It is a unique representation of, and tribute to the museum, the Park, and the heritage and spirit of each. The Centennial Railway Garden was produced by Balboa Park Online Collaborative in partnership with The San Diego Model Railroad Museum. The project team was Nik Honeysett (Project Director), Chad Weinard (Project Stakeholder),Brinker Ferguson (Project Manager), Jason Quinn (IT Technician), and Jason Alderman (Contractor for Experience Designer and Developer). The survey evaluation project team consisted of: Nik Honeysett (Project Director), Misty Suposs (Project Manager), Wesley Hsu (Contract Developer), and Dani Heinemeyer (Contract Grant Writer). San Diego Model Railroad Museum staff members: Anthony Ridenhour and Polly Toledo. The project was funded by an Institute of Museum and Library Services’ Museums for America Learning Experiences grant.